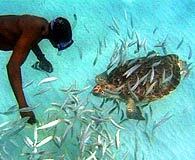 Barbados is home to a healthy population of hawksbill and leatherback turtles. Once endangered by over fishing, these great creatures are now protected and monitored throughout the Island. In some areas the local fishermen feed and care for them, scraping barnacles of their backs and making sure that their nesting area is safe. 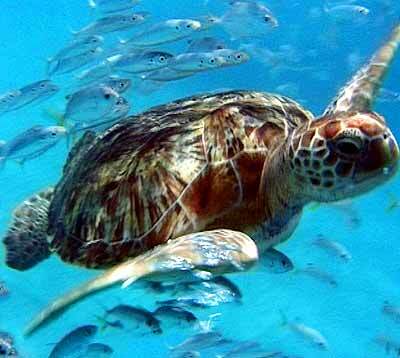 Turtles are sociable and tend to stay in the same area, following a steady routine. 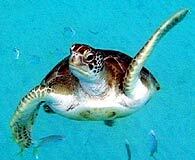 So long as they do not leave a habitat, they can be seen playing and feeding along the inshore reefs. In certain monitored areas they have become accustomed to humans and relatively tame. You can swim with them as they feed amongst the coral. A good way to do this is with a sailboat or catamaran tour and snorkelling picnic. 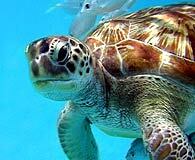 If you are in Barbados at the right time you may even take a moonlight cruise to see turtles nesting. Pregnant turtles come out of the water to lay their eggs in the soft sand along the shore. So if you are in a turtle nesting area, walk gentle. When the eggs hatch the tiny new turtles emerge from the sand and make their way to sea. If you are lucky you might see them on a moonlight cruise. Satellites-tracking of post-nesting hawksbills from Barbados to their foraging grounds elsewhere in the region.